The main problem the EU has is a PR problem not a financial one. However iso realising that this is not their year and fly under the radar as much as possible as far as the budget is concerned, they try to bring it in the news as much as possible and as negative as possible. Are these guys hired to do the PR for UKIP and other anti-EU parties? Furthermore the newspaper aticles that Lewandowski is one of the most talented European strikers must seen the picture been clearly wrong. The guy looks older than Sir Alex Ferguson. You would expect such a picture with an article that the pensionage for EU civil servants has, as an example for the rest, been risen to 75 or so. So basically an EU official just admitted that the actual inflation rate in the EU is 6.7 percent. 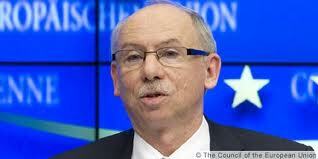 Tomorrow (Tuesday) an interesting interview with Wellink former Dutch CBer on the banking union in Handellsblatt. Lewandowski should be impeached! Along with Van Rompuy & Barroso. Once EU officials start being at a minimum, sacked, & at present at a maximum impeached, their attitudes & behaviour towards EU citizens & governments will improve wonderfully. But if that doesn't work, then....! The poor old Poles have lived under some sort of unelected dictatorship for as long as history. Then, due to the bravery and solidarity of their workers, they managed to break free. But there was no leadership that was not already tainted in the ways of the Politburo, and their leaders, like chickens let out of a battery farm, rushed back into the security of their backgrounds. Back to the opposite of democracy, away from truth and into propaganda, away from market reality and into control by the superstate. The Poles deserve better than this.